As soon as we heard that GQ would be getting into the subscription box game, you knew, of course that we would have to take a look and review it for you guys. We were, as it happens, super, super impressed with the first box. And, now, the second box has arrived. GQ’s box delivers every quarter, as opposed to the more common monthly boxes you might be used to. It’s called, as always, the GQ “Best Stuff Box” and it will run you $50 per box. So, we’re looking at a price a little bit higher than what most of these boxes usually cost. But, it’s only four times a year as opposed to 6 or 12, plus we think the value here is tremendous. Let’s get into it a bit more by taking a look at what came in this second box. Breda Visser Watch — $90: Last quarter’s big-ticket item was a pair of wireless running headphones. This month it’s this watch. And, let me tell you, this watch is really fantastic. We’ve seen a lot of subscription boxes come through this often, and many have included watches within them. They are usually crap. Not so here. This watch is absolutely wonderful, and singlehandedly is worth about double what you paid for this box. Everything else is now a bonus! It’s is uniquely styled with a blue face that is squared. It’s elegant and simple all at once. It stands out, but is also subtle. The gold tone hands and hour markers are beautiful, and the brown band is the perfect shade to match. It’s a perfect watch for a box like this, as it’s not the sort of thing I would ever personally pick out to buy, but I actually have fallen in love with this watch since receiving it, and it’s now amongst the favorites in my collection. And the quality is really there too. The watch feels and looks amazing. The blue finish on the face is detailed and ever so slightly brushed. The leather strap is, get this, one of the best feeling leather straps on any watch I have owned. It’s supple and rich, and feels like it could be made into a high end briefcase. It bests leather straps on watches I have that are 3 or 4 times the price. Again, this whole watch is just super, super nice, and well, well worth the price of this box alone. Image Skincare Prevention+ Moisturizer SPF 32 — $39: A nice moisturizer, and always nice to have some more SPF, especially in these summer months. A bit runny, and a a tad too scented for my taste. But, it’s nice to have in my collection. Boie USA Toothbrush — $12: See, this is just fun. Again, never the sort of thing I would even know to buy. Now that I have it, it’s become my go-to brush. It’s quite cool, comfortable to use, looks and feels way nicer than classic toothbrushes, and is a great accessory to keep out in my bathroom. This is a man’s toothbrush no doubt about it. I’ll be looking to order replacement heads the next time I need a new brush. Goodr Running Sunglasses — $25: I wear glasses, and so need prescription sunglasses, but for those that don’t, these are a solid pair of wayfarer-style glasses. Your color might vary, and the tint of the lenses might vary as well, but they’ll look cool, and definitely will hold on to your face during a run or workout. Anthony Hand Cream — $16: A very solid hand cream. Works very well, has a nice, subtle scent. Has become my go-to now. Areaware Bent-Nail Bottle Opener — $12: Another fun item I never would have bought myself, but is part of the joy of getting these subscription boxes. It now adorns my fridge. Skin Laundry Purifying Cleansing Cloths — $7.50: Another nice item to throw in your carry-on bag or briefcase. These are wipes to help clean up the natural build up of oil on your face throughout the day. When you can’t get to a bathroom or don’t have a chance to really freshen up, these are a lifesaver. Plus, they come in a neat little carrying bag. While I have received things like this in other boxes from other companies, they usually send two or three. Here you get well over a dozen. While I still always feel like I don’t want to use them up (ya know? ), I think I might actually give these a real shot. Certainly, they have been placed in my briefcase, and I look forward to needing to use them. Like we said above, this box will run you $50 per quarter, or $150 if you sign up annually (which saves you about $50, bringing the cost of each box down substantially, creating an even more insane value). The value in each box well exceeds what you pay. Unlike some other subscription boxes, the items you get in this box are truly high quality, top of the field items. There is no crap in this box. 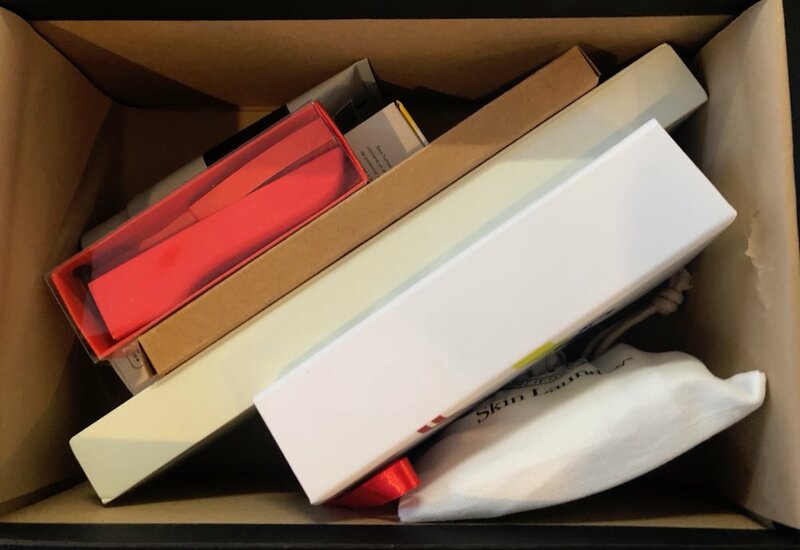 True, you might not use every item as it might not fit into your life, but overall, I was shocked at how much stuff came in this box, and the value inside of it, and the fact that GQ has now been able to deliver this same reaction two times in a row. I don’t know how GQ pulled it off, but I guess they are capable of doing things and making deals that the smaller subscription box companies cannot. They call this a “Best Stuff” box and it truly is. Again, color me surprised. But they really deliver here! It is a bit pricier than the other subscription boxes — even more than Bespoke Post at $45. Plus, you get no customization whatsoever (like you do with Bespoke Post), and have no idea what is in the box until it shows up (or until you read GQ online or in print, as they sort of start advertising it before everyone gets their box, something I wish they didn’t do to keep it a surprise!). Nevertheless, I think it is without question worth the money. Right now, if you could only subscribe to one subscription box, it should be this GQ one. Once a quarter is a much more reasonable frequency to get a box like this than once a month, and, if the third box is anything like this one, I fully trust GQ to continue to deliver awesome items you’ll be excited to use and try — even if you did not select them beforehand. Other boxes at cheaper price points give you products that are not as well curated, nor as high quality. GQ’s box gives you a bit of everything. Some lifestyle items, some grooming, some clothing. It’s the best of all worlds. As with so many things, you get what you pay for. If you’re going to subscribe to a service like this, we have seen without a doubt that a bit more money goes a much longer way. In my mind, it’s between Bespoke Post and GQ for the best subscription box. If GQ delivers another box like this in a few months (as our usual test is three boxes to gauge consistency) I think it will be signed, sealed, delivered in favor of GQ’s box. We’ll check back then! In the meantime, kudos x1000 to GQ on this one. I was skeptical they could deliver two times in a row, but this was supremely well done once again.